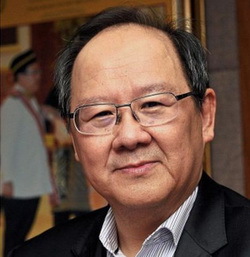 PETALING JAYA: The Public Sector Home Financing Board (LPPSA) should change its loans rule to allow the money to be released straight into the developer’s account if it is a direct purchase from the developer, said a senior lawyer. 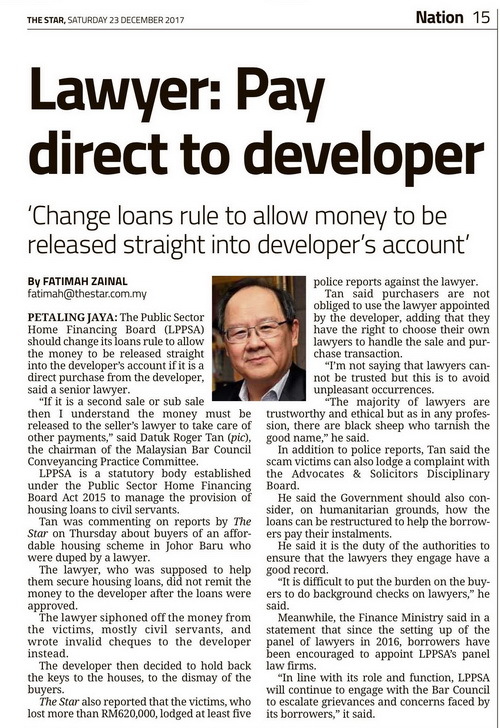 “If it is a second sale or sub sale then I understand the money must be released to the seller’s lawyer to take care of other payments,” said Datuk Roger Tan, the chairman of the Malaysian Bar Council Conveyancing Practice Committee. LPPSA is a statutory body established under the Public Sector Home Financing Board Act 2015 to manage the provision of housing loans to civil servants. Tan was commenting on reports by The Star on Thursday about buyers of an affor­dable housing scheme in Johor Baru who were duped by a lawyer. The lawyer, who was supposed to help them secure housing loans, did not remit the money to the developer after the loans were approved. The lawyer siphoned off the money from the victims, mostly civil servants, and wrote invalid cheques to the developer instead. The developer then decided to hold back the keys to the houses, to the dismay of the buyers. The Star also reported that the victims, who lost more than RM620,000, lodged at least five police reports against the lawyer. Tan said purchasers are not obliged to use the lawyer appointed by the developer, adding that they have the right to choose their own lawyers to handle the sale and purchase transaction. “I’m not saying that lawyers cannot be trusted but this is to avoid unpleasant occurrences. “The majority of lawyers are trustworthy and ethical but as in any profession, there are black sheep who tarnish the good name,” he said. In addition to police reports, Tan said the scam victims can also lodge a complaint with the Advocates & Solicitors Disciplinary Board. He said the Government should also consider, on humanitarian grounds, how the loans can be restructured to help the borrowers pay their instalments. He said it is the duty of the authorities to ensure that the lawyers they engage have a good record. “It is difficult to put the burden on the buyers to do background checks on lawyers,” he said. Meanwhile, the Finance Ministry said in a statement that since the setting up of the panel of lawyers in 2016, borrowers have been encouraged to appoint LPPSA’s panel law firms. “In line with its role and function, LPPSA will continue to engage with the Bar Council to escalate grievances and concerns faced by its borrowers,” it said.